In this photo released by U.S. Coast Guard, the 308-foot (94 meter) Chinese-flagged commercial fish carrier sits aground on Taka Atoll in the Marshall Islands Thursday, Jan. 3, 2019. The large fishing ship ran aground on a remote Pacific atoll early Thursday, and the U.S. Coast Guard said it was helping coordinate the rescue of its crew members. The 308-foot (94-meter) Chinese-flagged Ou Ya Leng No. 6 ran aground on uninhabited Taka Atoll in the Marshall Islands, Petty Officer 3rd Class Matthew West said. He said a Coast Guard HC-130 Hercules plane had arrived in the area and made contact with the crew, who remained aboard and were using emergency generator power. West said earlier reports the crew had left the ship and made it ashore on a lifeboat were incorrect. He said the Hercules had circled the area but there was nowhere suitable nearby for it to land. Two fishing vessels should arrive Friday to help rescue the crew, West said, adding that the Marshall Islands had also sent a patrol craft. There were no reports of injuries or pollution, according to the Coast Guard. West said it wasn't clear what caused the accident, the crew's nationalities, or the status of the ship's cargo and fuel. The fish carrier targets squid in the west and central Pacific Ocean, according to the Coast Guard. Taka Atoll, also known as Toke Atoll, is part of the Ratak Chain and is not far from Utirik Atoll, which is inhabited by about 400 people. The Marshall Islands is home to about 60,000 people and has close ties to the U.S. under a Compact of Free Association. West said that decisions about how to deal with the stricken ship would likely be made by the Marshall Islands government as it had grounded in the nation's territorial waters. He said that communications with the region were difficult and that the situation remained fluid. The area was experiencing 11-foot (3.3-meter) -high seas and winds of 25 miles (40 kilometers) per hour, with conditions forecast to deteriorate, according to the Coast Guard. The Hercules came from Wake Island, where the crew was previously involved in helping with a vessel that caught fire while carrying cars from Japan to Hawaii. 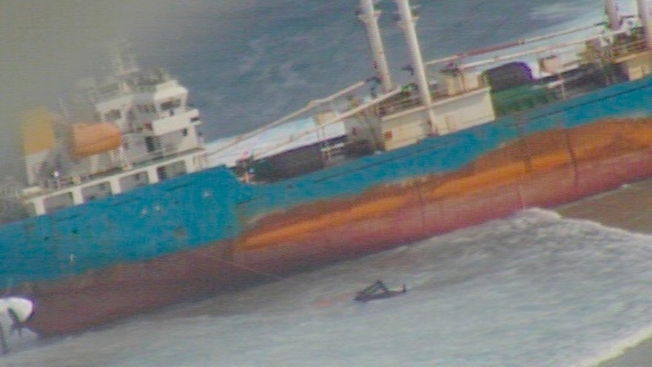 Sixteen crew members were rescued from the Sincerity Ace vessel, while four others were listed as unresponsive and one remained missing.